Information which are placed here should inform you about BTH Import Stal product range such as: stainless steel sheets, coils, tubes, rectangulars, round bars and many others. Apart from trading of stainless steel we could offer services . We also spread our offer due to the service besides wet grinding sheets, round tubes, rectanqulars, flat bars we can offer laser and water cuttingand bending steel. 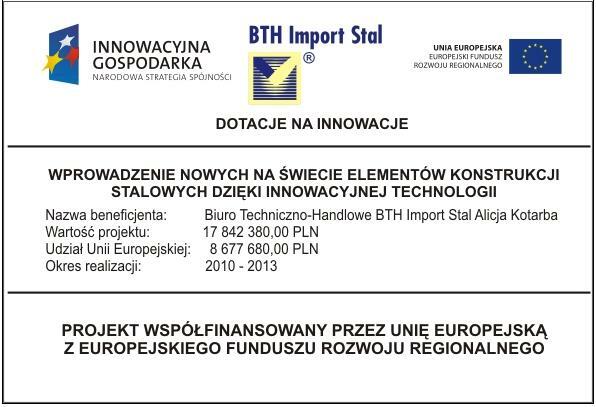 BTH Import Stal has been the leader on the Polish high-alloy and stainless steel market from more than 20 years. Since the very beginning the company’s growth is characterized by dynamism, starting from expanding of the stock assortment offer, through implementation of services connected with steel processing. For several years the company has successfully rendered complex services for its customers both in Poland and the EU. BTH without no doubt is one of the biggest Polish importer of stainless steel which we owe to long-term cooperation with major producers from Europe and Asia. We are able to work effectively with customers, both representing the main sectors of the Polish economy including the chemical, machinery, food industry as well as with small businesses. For several years BTH Import Stal steadily widening the range of stored materials and range of offered services to meet the needs and requirements of most demanding customers.